Tonight, we saw Team Canada crush Team Russia at ice hockey, the score was 7-3. It reminded me of this article from the New York Times entitled, "Olympic Medals Prove Elusive For Russia." The Olympics are not even half over, but Russia seems to be suffering a collective panic attack over the lackluster performance of its athletes. “Russian Olympians Lose Historic Superiority” was the front-page headline on Thursday in Kommersant, an influential newspaper. Some politicians and commentators are calling for the firing of Russia’s sports minister and the head of the Russian Olympic Committee. The gloom seemed to thicken on Friday as Russians woke up to the news that their superstar figure skater, Yevgeny Plushenko, took only the silver. Even worse, Russia's powerhouse men's hockey team faltered against Slovakia, falling to the former Soviet satellite, 2-1, in a shootout. Among the few areas where Russians could still earn a gold medal at the Vancouver Olympics, the mass circulation tabloid Moskovsky Komsomolets said, is excuse-making. Athletes have blamed the weather, the facilities and even the humidity for their lapses. After Australian aboriginal groups accused a Russian ice dancing pair of mocking aborigines, Valentin Piseev, president of the Russian Figure Skating Federation, suggested that they were the target of an international plot to force them to alter their performance. “I think that this is a well-executed strategy directed against our athletes,” Mr. Piseev told Russian television from Vancouver. In Russia, international athletic competitions — particularly the Winter Olympics, in this frozen country — are considered one of the last prominent international arenas to showcase the country’s strength. The anxiety has been heightened because Russia will host the next Winter Games at the Black Sea resort of Sochi in 2014. The governing United Russia party, led by Prime Minister Vladimir V. Putin, released a statement on Thursday suggesting that there could be repercussions for athletic officials if Russian athletes continued to fall short in Vancouver. When Vladimir Putin makes a threat, you better believe he's good on following through with it. After more than two years without a car, I finally pulled the trigger last October and bought a car. It took me a while to finally build up enough credit and cash for a decent down payment. When I first started my research, I was looking at entry level cars such as a used Honda Civic or Toyota Corolla, but I wasn't too comfortable with the high mileages these cars had in my price range. By August 2009, my circumstances changed a bit and I rationalized moving up from entry level cars to a little better. I generally dislike buying something, and having to upgrade it a year or two later. I planned to keep my car for at least five years, so that changed the equation a bit. With that time frame, hybrid vehicles started making sense because the gas you save from them will payoff the premium you pay up front for them. Hybrids are also a lot cheaper in California than in Victoria, so it seemed like a really good price as well. The geek in me also enjoys all the technology that they pack into hybrids; I have a much easier time understanding electronics in a car than its mechanical parts. I had narrowed down my choices to a Mazda 3, Chevy Camaro, Honda Civic Hybrid, Toyota Camry Hybrid, and Nissan Altima Hybrid. The Camaro was the first to get dropped off my list because an American muscle car just doesn't suit me, it's way too flashy and I don't like coupes. I will admit it's a sweet ride though. The Mazda 3 was the next to get dropped from the list because at this point, I had my heart settled on a hybrid. If I wasn't after a hybrid, the Mazda 3 would be a worthy contender because the price was very reasonable, it came with a ton of features by default, and it's fuel efficiency was quite good. You'll probably notice that the Toyota Prius is missing from the shortlist. I find the shape of the Prius quite ugly, and I really don't like the social connotations around owning a Prius. If you want an explanation, see this South Park clip entitled, "Smug Alert." Ideally, I wanted a hybrid car that looked like a normal car, and had a little power to it (might be a contradiction). In hindsight, it was also a good idea that I didn't go with Toyota since they're having quite a number of very severe problems with their breaks/accelerators which has caused the Camry and Prius to be recalled. The clear winner in the shootout was the Nissan Altima Hybrid due to the performance, tax incentives, and dealer incentives. It was cheaper for me to buy a new one than a used one. In addition, for the 2009 tax year, the stimulus package allowed me to deduct sales tax and registration fees for new vehicle purchases. I went down to the dealership to do a test drive of the vehicle, and it was a pretty cool experience because it was the first time I had driven a hybrid. If you're driving steady, below 40mph (~64km/h), you can run purely on electric power. The car is practically silent when it's on electric. The car also had a continuous variable transmission (CVT) drive which meant you could accelerate the vehicle without feeling any shifts in the gears because there are no discrete gears. The car also had regenerative breaks which converts the car's kinetic energy to electric energy (to recharge the batteries) when you tap on the breaks. The car's range is also fairly impressive, I can drive 560miles (~900km) before having to fill up on gas. I fill up on gas once every 2.5 weeks. 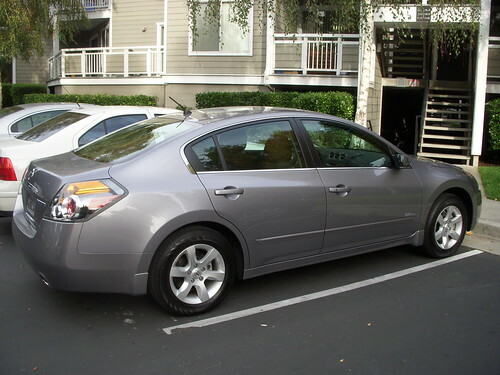 There were a couple of cons about the Nissan Altima Hybrid though. First, the trunk is extremely small because part of the space is taken up by its battery pack. The other major disadvantage was that the car's options were very expensive because you had to buy them in bundles. Fortunately for me, I was more than happy with the base model, but if someone wanted to have GPS and leather seats, it got quite expensive. The timing of my car purchase worked out really well. It was during their year end clearance sale, and they were trying to get rid of all of their 2009 models. Thankfully, the last Altima Hybrid on the lot was exactly the model and colour that I wanted. Next was the price, I had six Nissan dealerships competing against each other, and I managed to get the car at well below invoice price. I did all my negotiations via email, so by the time I walked into the dealership, it was a very easy and straight forward process since we had already agreed on a price. Nissan was also able to access my Canadian credit history from Nissan Canada, so that made the car loan possible. Overall, it was a pretty good learning experience. I've discovered I'm a pretty good negotiator. Since my car purchase, I've helped negotiate car deals for two other friends. Attached below is the picture of my car. I've dubbed it the Blackbird because it's a really stealthy car. Under 40mph, it doesn't make a lot of noise, and I can easily sneak up on unsuspecting pedestrians. Instructor: Sir, please start your car. Chan: Yeah, it's already started. Instructor: No, I mean I want you to start the ignition of your car. Chan: Yeah, the car's on, it's a hybrid. It's silent when we're idle. Instructor: Oh wow, what does this button do? For the rest of the ride he was just asking questions about the car instead of actually paying attention to the road test. Consequently, I only had three demerits . Last funny story about the car. When I wrote my mom that I had purchased a new car, her response was, "remember to keep your car clean, son. Girls like clean cars." I'll have to keep that in mind. Overall, I'm quite pleased. This is quite a step up from my last car which was a standard hungry grad student beater car. My last car was a Chevy with a ridiculous V6 engine which ate gas, it got 18/26mpg.